Luxury villa, fabulous sea views, 2 bedrooms, 2 baths, private pool. We have done our very best to make this lovely90 M2 Cretan house YOUR home for the holidays. ON REQUEST: special Honeymooners: candlelit dinner, private chef, flowers... Just let us know. For family and friends : BBQ, cruise to island of spinalongua, visit to any historical sites, scuba diving lessons... Just ask we will arrange it for you. Villa Hellios, is a luxury villa, built to fit perfectly between the gorgeous countryside and the breathtaking views over Elounda bay. Set in Mavrikiano, a typical village, 2 min from Elounda and its blue flag beaches, you will definitely enjoy the low key, cool pace of life there. Everything has been done to make our guests happy and to offer them 'hassle free' holidays from day one! Internet access, Flat screen TV + satellite + DVD players in every rooms, storage space, leather sofas sitting 5, fully equipped kitchen ,sunbeds, garden set with BBQ. You'll love swimming at all time in your private pool (21 m2) enjoy lazy afternoons on the terrace, have breakfast in bed watching sunrise from your bay-window,nap as long as you want in the garden,, have a romantic dinner 'al fresco' watching the shimmering lights of Elounda at night. Welcome! ACCESS and parking: dear guests, as many properties in Elounda, our villa is built on top of a steep street. Please keep this mind when you will rent a car. Small cars are always easier to use in this area, like Suzuki 4X4 or any of these kinds, Big cars, will have trouble accessing the narrow streets of Aghios, and are too heavy to go up steep streets and hills. You have your own private parking space in front of the house, but getting to the house will be much easier if you rent a smaller car. 5 years of experience taught me well!!! 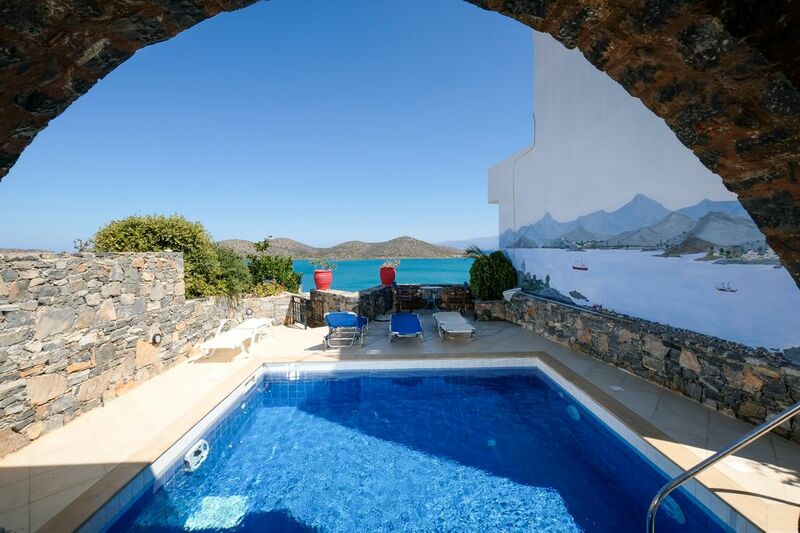 lovely villa , low key, near the sea , wonderful view, close to elounda center.. THE VIEW first of course ! Arrive in Elounda and relax! Our staff will wait for you at ANYTIME of day and night, We can arrange pick up at Heraklion airport for you and your family, advise you on car rental rates and directions. Just ask, we will be happy to help! Wonderful Villa, with amazing views. A truly fantastic place to sit back and unwind. Far enough away and close enough to all that Elounda has to offer, with a couple of superb Tavernas and bars within a 2 minute walk. My family felt relaxed, at ease and totally safe in the neighbourhood that was a mix of locals and a small amount of tourists. Don't let the hill put you off, it's worth the view of the moon and Elounda in the evenings. Ella's communication beforehand and when we landed were 1st class, and Mario who looked after the property for the time we were there was absolutely superb. I couldn't recommend Elounda and this Villa highly enough, my family and I had an amazing time and would definately look to book again. thank you for your kind words. We try our best and we do appreciate when our efforts are noticed ! It was a pleasure to welcome you and your family in Hellios ! please come back and enjoy Crete again ! Lovely views and Elounda is a great location. Villa is very comfortable and really well presented. Lovely villa. Fab views and a cosy, secluded place to stay. Kitchen could do with better utensils and kitchenware but otherwise a really lovely place. So happy you had a non ce holiday ! Yes you are right ! Its end of the season and time to refurbish kitchen cabinets ! New stuff are on their way ! Hope to have you back next year ! A beautiful compact bijoux villa with stunning views and gorgeous pool and terrace area. It is tucked away and sufficiently private but you are still able to see what's going on in the busy little harbour below. There is a wide choice of friendly well priced restaurants within walking distance and the neighbouring locals are very friendly. The Bluebay Crete Management organised a meet and greet and could be contacted if needed. We had a wonderful week here and will definitely return and recommend to friends and family. lovely villa ,just like the photos ...No mention of the hill though !!! wow what a hill . It made every trip fun , just like a roller coaster !Thanks to Laura for our little gifts , much appreciated and also the welcome pack think that is a must if you are thinking of booking your holiday there ....you will love the wonderful views.Don't forget to wave to the dear old lady on the corner too .If we return to Elounda we would choose the villa again . Thank you pat! Im glad you had a great time! Perfect location, lovely spotless villa, wonderful experience. Thank you! You have been wonderful guests! Absolutely stunning Villa. We travelled in November - a little later than normal - and it was therefore important to us to have a few home comforts. The Villa didn't disappoint. Beautifully appointed, lovely decor and very comfortable. Plenty of seating areas for eating, reading or sunbathing with sun or shade to suit from dawn until 4pm. Extremely comfortable bed - often hard to find in Greece. Loads of storage space and very well thought out rooms. Well equipped kitchen which had everything we needed to self-cater. Only one small comment - there were no soup/cereal bowls - but there were some lovely big cups which sufficed! We wouldn't normally need bowls in Greece but as cornflakes were provided in the welcome pack, we thought we may as well eat them!! Super views both front and back. Extremely quiet location. Central heating was used for a few of the evenings and was very effective. A real bonus for us was the internet access - a "must have" item when you run a small business - this was fast and worked on demand every time. The location itself was great and provided a good base for exploring the local area. Centre of Elounda is only 10 minutes walk away and the town has every facility, plus some lovely back-streets, hill walks and beaches within a reasonable distance. You could easily manage without a car, but the slope up to the village wouldn't suit everyone. One tiny point which didn't affect us but might affect the less agile and is worth knowing is that there is no hand-rail on the stairs. We would thoroughly recommend this Villa to anyone and hope to return in future years. Thank you for your nice comments! Come back anytime! We are happy that our guests can now enjoy the internet connexion, as it was really something they were asking for...now its done! About the stairs we will definetely think about it,although its our first comment on that subject, but, it can greatly improve the stay of many guests. Thank you Liz and doug! Mavrikiano is a typical Cretan village,2mn from the colourful town of Elounda, where there is all you can wish to spend the best holidays ever: 'blue flag' beaches, water sports, local tavernas, typical 'kafenion' (cafés), seafood restaurants, bars, pubs, disco nights, shops, souvenirs, jewellers, bookshop and newsagents, supermarkets, latest fashions stores, all day dining, departures from the famous island of Spinalongua... Elounda is only 9km from the Cretan 'Saint Tropez': Aghios nikolaos, where you will discover (day and night) the Cretan way of life in the summer! The pedestrian streets are famous for their shops and restaurants, market on Wednesdays will give you a taste of local products and maybe you will find time to visit Kritsa only 15mn drive from Aghios, one of the most exquisite Cretan village ever seen. rent a and visit the Lassithi region, the monasteries, the oil farm, the archaeological sites so close to Elounda.